Earth Fossils on the Moon — Could They Unlock the Mystery of How Life Began? Research by a team of scientists at the University of London reinforced a theory that evidence of life on the early Earth might be found in rocks on the moon that were ejected during the Late Heavy Bombard period — about four billion years ago when the Earth was subjected to a rain of asteroids and comets. Given that material from early Mars has been found in meteorites on Earth, it certainly seems reasonable that tens of thousands of tons of terrestrial meteorites may have arrived there during the Late Heavy Bombardment. Research by a team under Ian Crawford and Emily Baldwin of the Birkbeck College School of Earth Sciences at the University of London in 2008 used sophisticated technology to simulate the pressures any such terrestrial meteorites might have experienced during their arrival on the lunar surface. In many cases, the pressures could be low enough to permit the survival of biological markers, making the lunar surface a productive place to look for evidence of early terrestrial life. Any such markers are unlikely to remain on Earth, where they would have been erased long ago by more than three billion years of volcanic activity, later meteor impacts, or simple erosion by wind and rain. However, meteorites arriving on Earth are decelerated by passing through our atmosphere. As a result, while the surface of the meteorite may melt, the interior is often preserved intact. Could a meteorite from Earth survive a high-velocity impact on the lunar surface? Crawford and Baldwin used finite element analysis to simulate the behavior of two different types of meteors impacting the lunar surface. Crawford and Baldwin's group simulated their meteors as cubes, and calculated pressures at 500 points on the surface of the cube as it impacted the lunar surface at a wide range of impact angles and velocities. In the most extreme case they tested (vertical impact at a speed of some 11,180 mph, or 5 kilometers per second), Crawford reports that "some portions" of the simulated meteorite would have melted, but "the bulk of the projectile, and especially the trailing half, was subjected to much lower pressures." At impact velocities of 2.5 kilometers per second or less, "no part of the projectile even approached a peak pressure at which melting would be expected." Crawford concluded that biomarkers ranging from the presence of organic carbon to "actual microfossils" could have survived the relatively low pressures experienced by the trailing edge of a large meteorite impacting the moon. Crawford suggests that the key to finding terrestrial material is to look for water locked inside, these hydrates, can be detected using infrared (IR) spectroscopy. Many minerals on Earth are formed in processes involving water, volcanic activity, or both. By contrast, the moon lacks both water and volcanoes. Crawford and his co-authors believe that a high-resolution IR sensor in lunar orbit could be used to detect any large (over one meter) hydrate meteorites on the lunar surface, while a lunar rover with such a sensor "could search for smaller meteorites exposed at the surface." Crawford suggests that it might be necessary to dig below the surface to find terrestrial meteorites. He adds that collecting samples, observing them on the lunar surface, and picking those that warrant a return to Earth for detailed analysis "would be greatly facilitated by a human presence on the moon." The last U.S. astronaut to set foot on the moon, Dr. Harrison Schmitt, was a geologist. 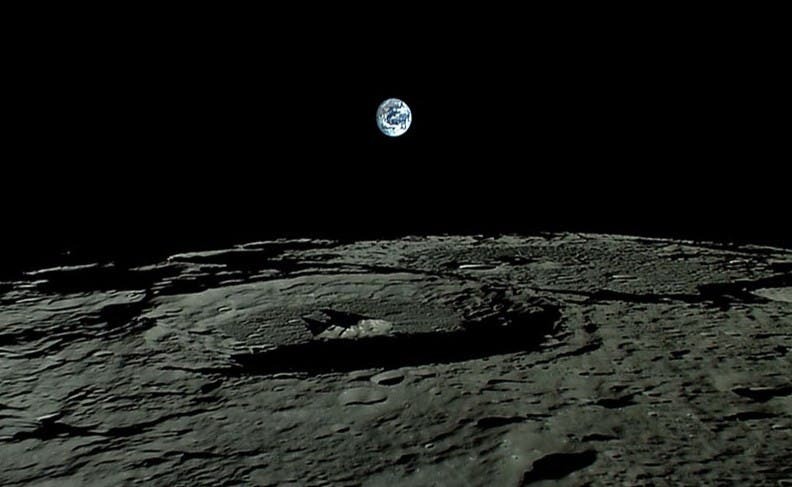 With NASA's plans for a return to the moon later in this century shelved, it looks like it will be up to China to search for hydrated rocks, and solve the mystery of how life began on the Earth.